Harriet Ross was born April 12, 1925, and will celebrate her 90th birthday next month. She grew up in Northern New Jersey but spent every summer (“from Memorial Day to Labor Day”) at her paternal grandmother’s home in Spring Lake, NJ. She could walk to the beach in about 15-20 minutes and developed her love of swimming, both at the beach and in the pool, beginning at a very early age. By high school, she was swimming competitively and eventually earned the AAU title of champion for the state of New Jersey in free style. Harriet remembers loving her high school years and doing very well as a student. Her father encouraged her to go to college and she went on to graduate from Cornell University. She studied mechanical engineering until her last year when she took an elective in international organizations and “became very fascinated with the debates before the different assemblies and international organizations,” she recalls. Her grand-aunt suggested that she study law. Harriet’s parents moved to San Francisco while she was at Cornell so she joined them after graduation and immediately loved her new home. She attended University of San Francisco Law School at night, working during the day as an engineer to pay her tuition expenses, including a stint with Bechtel designing power plants in Saudi Arabia. While at Belli’s office, she had her first experience with politics as the National Co-Chair of Youth for Eisenhower/Nixon in 1956. She traveled around the country campaigning for the ticket and remembers being invited to the Eisenhower farm in Pennsylvania. Harriet remained with Belli for five years, largely training herself. “They gave you the work, but you had to solve the problems.” She eventually moved to the Public Defender’s Office after a colleague encouraged her to apply. Initially reluctant to take on criminal cases (“The stakes are very high – I didn’t want to be responsible for a person losing time in their lives by going to prison if I lost the case.”) but found that she was very good at it. “I enjoyed the whole thing of arguing to the jury. I found I had the ability to see the issues very clearly and to cross-examine.” She eventually spent 22 years in the Public Defender’s Office and became one of the best trial lawyers in the City. In 1974, a friend suggested that Harriet might enjoy joining the Metropolitan Club. She was immediately attracted by the swimming pool and began her 40 year habit of daily swimming. She also liked the idea of belonging to a club for women only. “I was around men all the time. I didn’t need a club with men in it.” Like so many members, she has found the Club to be a personal oasis. Harriet also belongs to the Commonwealth Club and enjoys attending programs of the Pacific Research Institute. One of her treasured experiences was participating in an American Bar Association exchange program to Oxford, England. Harriet has had a very full life. She raised a daughter who lives in Cow Hollow and has a grand-daughter who is married and lives in Paris. Once a year Harriet travels to Paris both to visit her grand-daughter and take part in trips and events sponsored by the French Heritage Society. 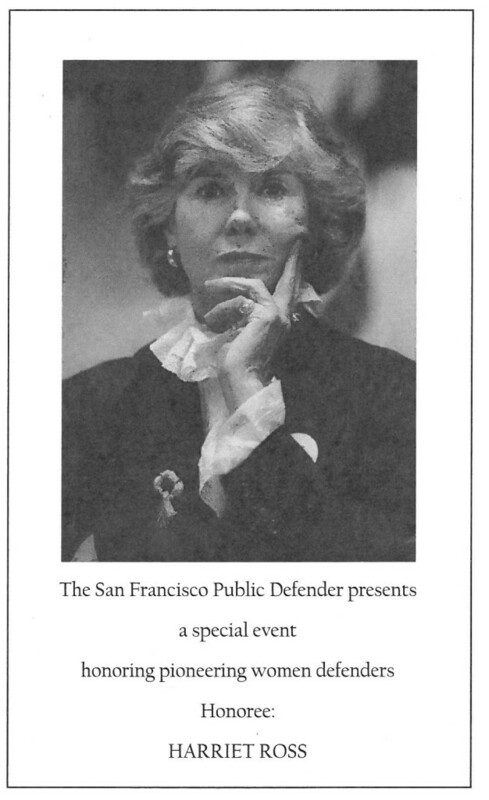 In 1987, having served as Chair of the San Francisco Republican Party, Harriet ran unsuccessfully for US Congress against Nancy Pelosi. She also ran for San Francisco Supervisor. Asked to comment on the keys to her success, Harriet responds, “I was kind of a toughie. Things would roll off my back.” Early in her career as a criminal defense attorney, she went to pick up the discovery documents for a case she was working on and was told by the murder investigator’s department that they would give her “what we want to give you.” “You’ll give me everything I’m entitled to,” she informed them.